Nma isn’t lazy when it comes to loving and eating plantain. Her favourite way? Fried and enjoyed with rice and stew. 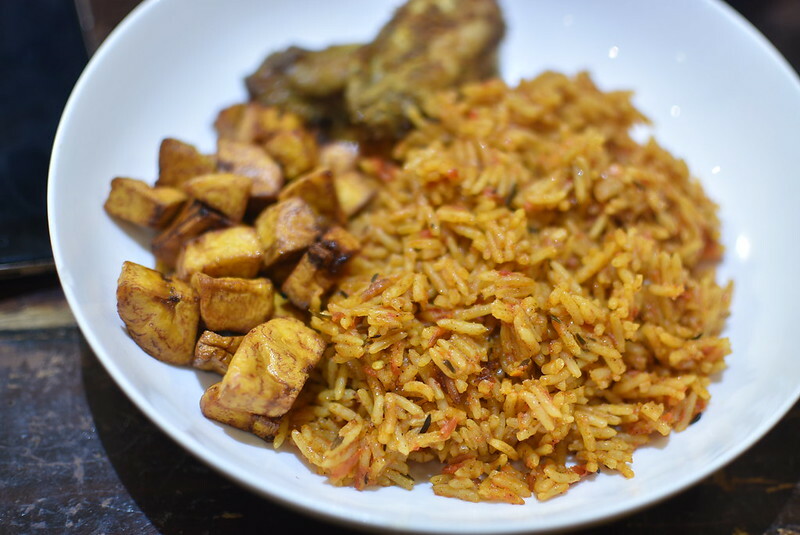 Most Nigerian parents would be proud, for in Nigeria when you’re out and you complain of hunger (aka lusting for junk food…), the parents might go – ‘Don’t worry, there’s rice at home’! Need I say more? Thank you, Nma. I particularly like that mixed meat recipe you suggest! It’s no secret that my favorite food in the world is plantain. Not bananas; plantains, specifically ripe plantains. I can eat plain fried ripe plantains on its own or with any side but my favorite way to eat it is with rice and stew. 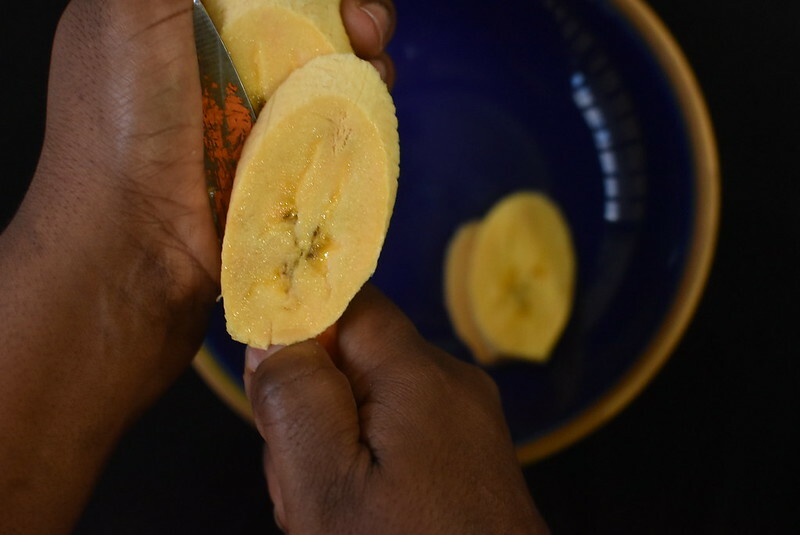 Growing up Nigerian, plantain played an integral part in my mother’s kitchen and what made it even more exciting was that we had a few plantain trees so we always had plantains in our kitchen. As a young child, I remember trying to be a good kid and asking for a reward of sweet and salty plantains from mommy right after she salted them to get them ready for frying. Even now, my Ajebutters hover around me in the kitchen once they see a ripe plantain in my hand. Most references to Ajebutters imply children who haven’t experienced the harshness of life, who may not have street smarts. When it comes to food, there’s something about plantain served with stew that gives me the ultimate satisfaction. Although I love a good plantain cake, here the simpler, the better; no ritual is needed. One way I have come to enjoy seasoning plantain is by adding a little salt. There’s something about a slightly salty and sweet fried plantain that brings me to culinary, swalty ecstasy. The best type of plantain to make into fried plantain or “dow dow” as I call it is a medium soft plantain – that is one that is not too hard and not too soft. It’s like the perfect crunch of well made chinchin; right in the middle! To fry hard ripe plantains, all you have to do is add a little salt and let it sit for a few minutes, you’ll see the sugar oozing out of the plantains. Fry immediately and enjoy. I find that while diced plantain works fabulously with Jollof or fried rice, when it comes to the different types of cuts of plantains, I’m not really particular. So far it is fried, sweet/salty, we’re good! 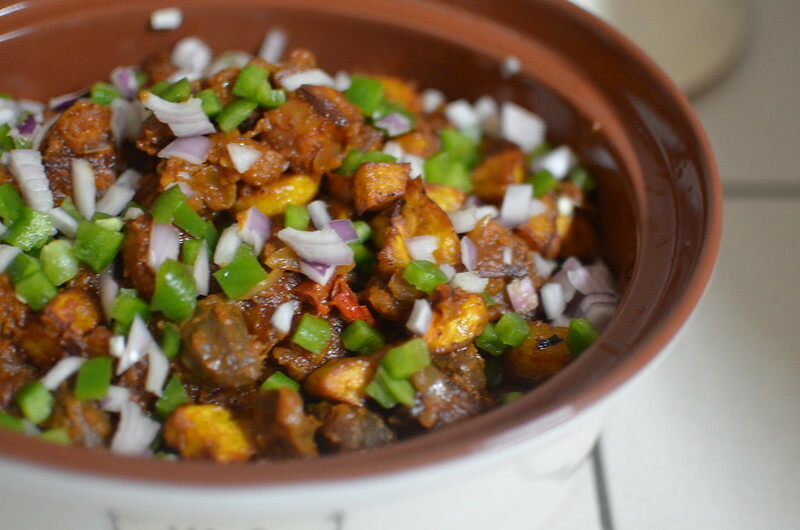 Another way I enjoy plantain is by making the almighty gizdodo. 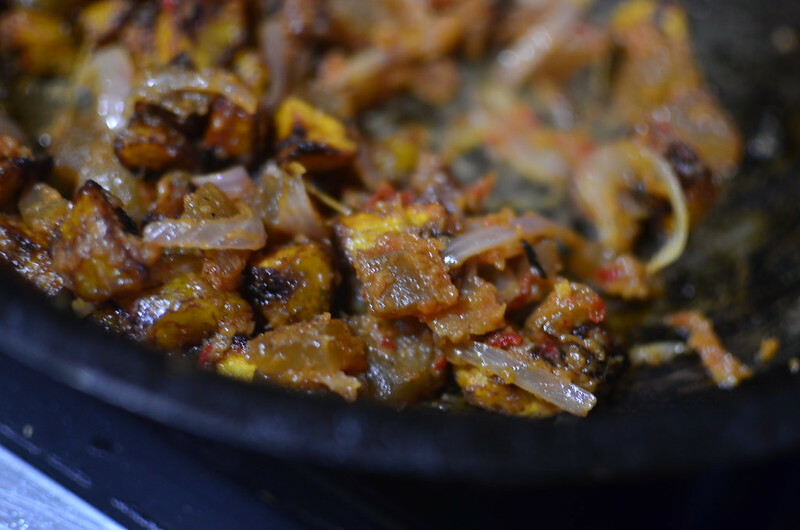 It’s simply plantain, diced, salted and fried then folded with fried gizzard into a spicy non drip stew. The spiciness and sweetness of this dish is absolutely incredible. Then there’s plantain then mixed with different types of meats. This is made just like gizdodo only with tripe, beef, chicken, cow skin and gizzard. The eating of the fried plantain with the stewed and chewy tripe and ponmo (cow skin) is one that is able to calm a woman in labor. And just like the kola nut, he who brings plantain brings life. My name is Nma and I am NigerianLazyChef. Born into a family of 7, I never liked the kitchen – now, it has become my safe haven. I spin local Nigerian dishes into perfection.